Central Mississippi in the Choctaw/Philadelphia area. 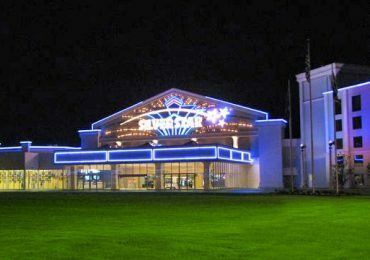 The 515,000 square foot casino features 3,100 slots and ninety-six table games. There are more than 1,000 luxurious guest rooms between these two Mississippi casino/hotel properties, as well as 11 different restaurants to choose from. For the total spa resort experience visit The Spa at Silver Star. At The Spa you can enjoy a steam bath, sauna, body treatment, massage or a visit to the whirlpool. Test your golfing skills on one of the nation’s highest rated courses, Dancing Rabbit Golf Club. With two award-winning 36-hole courses, you can enjoy a round of golf that you won’t soon forget. Enjoy a very exciting nightlife with nightly live entertainment in one of the lounges and headlining acts in The Arena at Golden Moon.